The Platinum Series is one of the top tier ovens made by ilFornino. It is made from heavy gauge stainless steel with an attractive Octagon Dome. Double walls that are 6" thick. 3-Layers of Refractory Ceramic Fiber Insulation that guarantees hours of heat retention. Quality straight line continuous welding shows excellent workmanship. The ilFornino® Platinum Series flooring is made from 1.5" thick One Flat Cooking Surface™ that guarantees an even heat distribution and retention. Floor will stay hot up to seven hours which is great for baking breads, bagels, pies, cookies, and anything that requires floor heat. Comfortable working height of 40". 900 °F Thermometer dome mounted. Heats up between 25-30 minutes and retains the temperature at about 850+ °F. On average you can cook a pizza in less than 2 minutes. ilFornino® Platinum Series comes with a stand. You can easily remove the oven and place it on top of an outdoor kitchen mantel. It includes a Professional Brush with Scraper, a professional 10" Pizza Peel, 4 carrying handles, and the user Manual. Oven outside dimensions: 38" L x 34.5” W x 21" (to the base of the Chimney). Height of chimney stack is 27" H x 4.5" in Diameter. ilFornino® Platinum Series is built tough and is one of the best ovens money can buy! 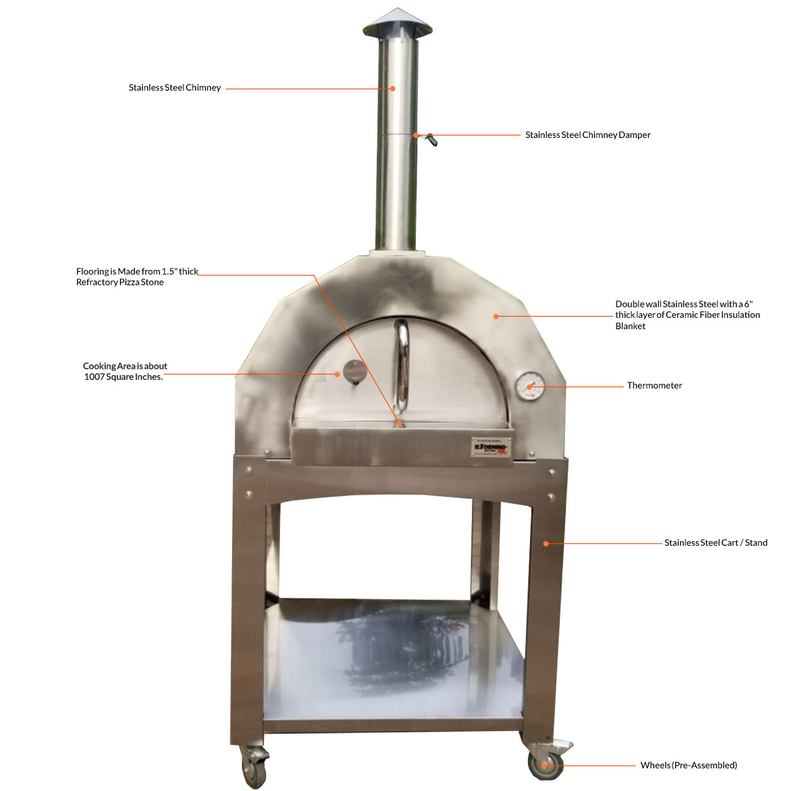 ilFornino Platinum Series wood fired pizza oven is one of the best oven. I am giving 5 Star for the performance and build quality. My Favorite part of the House! Absolutely love my Wood Burning Oven! Easy to use and Recipes taste amazing! A real crowd pleaser, from pizza, to wings, steak and Fish! Il Fornino was a great buy as well - people were great to deal with. Love this pizza oven! It works great and looks nice and very easy to use. I cooked with it for the first time today and really enjoyed to use this oven. The pizza was nice & crispy and the topping was perfectly done. Amazing quality, reasonable price and easy to use. Have not used it yet but the quality looks to be good. I researched for more than a month for buying a wood fired pizza oven. I'm really happy with the output of this oven. I required cover for the oven they just delivered to my place in just 5 days. I can bake pizza in 1 or 2 minutes. We purchased this for our winery. It is really a great oven.